Finally! A musical not based on a movie. Fun Home, which is based on the graphic memoir of the same name will open on Broadway at the Circle in the Square Theatre on Sunday April 19. The show first premiered at the Public Theatre in September 2013 where it won the Lucille Lortel, Outer Critics Circle, New York Drama Critic's Circle and the Obie Award for Best Musical of the Year. That's a lot of awards my friends. Now here we are almost fifteen months since the show closed Off-Broadway and Fun Home is ready to take Broadway by storm. With book and lyrics by Lisa Kron (Well) and music by Tony nominee Jeanine Tesori ( Shrek, Caroline or Change) Fun Home is one of this season's most highly anticipated shows of the year. Even though I have yet to see the show I have heard nothing but raves from my friends and colleagues who have seen it. Not too mention the critic's who raved about the show. I smell a hit! Now as I said I have never seen the show so except for what I have read online I'm sure I really won't get the full effect until I see it. Let's hope I get the chance too in the near future. I know. I know. You're intrigued aren't you? So what exactly is Fun Home about? Well I'll tell you. Here is a brief synopsis about the show for you to check out. Enjoy! Fun Home is a fresh, bold and original musical based on Alison Bechdel's autobiographical, best-selling graphic novel. After her father dies unexpectedly, Alison dives deep into her past to tell the story of the volatile, brilliant, one-of-a-kind man whose temperament and secrets defined her family and her life. Moving between past and present, Alison relives her unique childhood playing at the family's Bechdel Funeral Home, her growing understanding of her own sexuality, and the looming, unanswerable questions about her father's hidden desires. Named "Best Musical of the Year" by the New York Times, New York Magazine, Daily News and more, Fun Home is a daring and innovative work about seeing your parents through grown-up eyes. Well I'm sold. Although I'm not surprised. Being a writer myself I have always been drawn to shows with serious subject matter not too mention shows that take a lot of risks. How about you? Sound like something you might want to see as well? Good thing for you that we sell tickets for Fun Home isn't it? 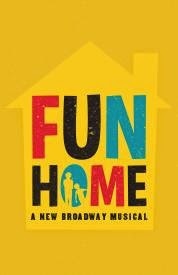 In fact if you order right now we can get you tickets to see Fun Home at prices that can't be beat. Still not enough to convince you? Well guess what? Besides being the smallest theatre on Broadway it is also in the round. That means all the seats are great. Sounds like a win-win to me. Get your tickets to see Fun Home on Broadway. Expect this show to be a big contender if not winner at this year's Tony Awards. Until next time theatre fans.